Features (2) lights settings; on with no animation or flashing. 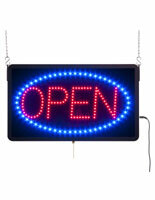 Glass tubing and LED lighting is brighter and conserves energy when compare to neon signs. (2) Black chains included for hanging the display at the store fronts. 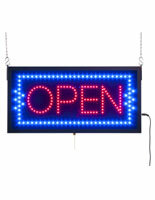 These open signs have a bright, bold "Open" message that clearly tells passersby that the store is ready for business! Each unit utilizes bright, LED light that is brighter and more energy efficient compared to neon lights. 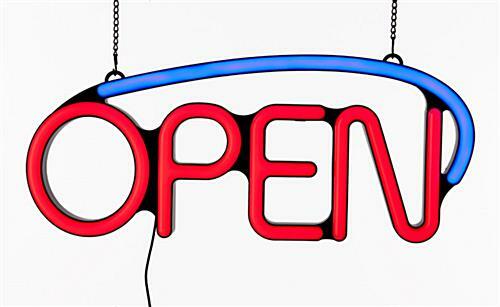 Therefore, business owners can keep the lights on all day long without having to worry about expensive electric bills! 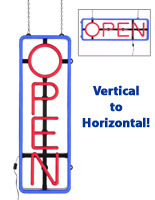 These window displays, hanging open signs provide superior visibility to customers, even from afar! 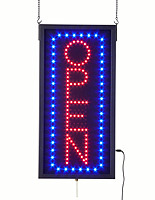 Each unit has blue and red lights that will definitely draw the attention. These illuminate animated displays, open signs that have two animation modes enables users to choose the preferred setting for creating an enticing window presentation. Additionally, users can also change the speed on how fast the letters illuminates. This business signage will shine in the day and glows brightly in the night! 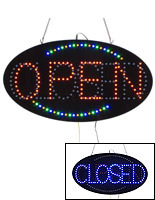 These open signs that have vibrant lights do much more than simply communicating to customer that the establishment is open for business. The illuminate window displays also helps to increase foot traffic into the store. 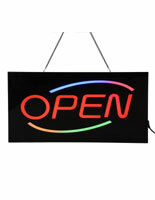 These open signs that are lightweight can be easily hanged on a door, in window or store fronts with the two hanging chains included. LED displays, like the one seen here, are great for use in restaurants, churches, bakeries, coffee shops, tanning salons and car dealerships. 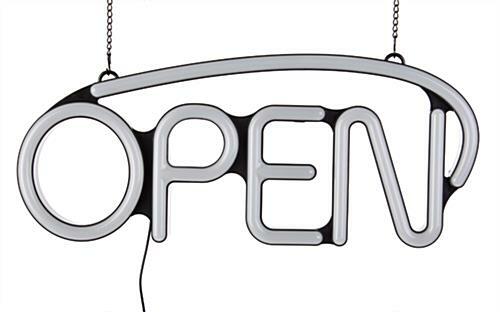 These open signs, also known as window lightboxes, should only be used indoors. The entire unit is safe to touch and operate. A power plug will be provided together with this unit. 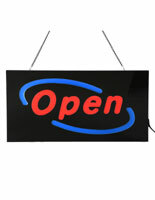 Purchase this business signage at an affordable price. These window displays will be a great investment for any businesses! 22.5" x 14.5" x 2.3"
This is a really nice sign. Looks like neon, but with the energy-efficiency of LED. Happy with this purchase. We appreciate you taking the time to write the review, Jill. Thank you! Seems to be pretty good. The animation is adjustable from VERY fast to a slow speed. The only problem I had is that the box appeared to have been opened and I only had one chain to hang the sign with. I'm not sure if there should have been 2 chains or one as the specs and description disagree. But so far the sign meets my needs. Hi Kris, Thank you for your feedback. We will have a customer care specialist reach out to you.